Somerville's Bagel Bards find an "Official" Home. form a community of writers. 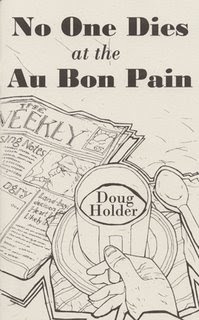 It also has been an inspiration for his own poetry Holder said:"I have written two collections of poetry based on my experiences there: " No One Dies at the Au Bon Pain" ( sunnyoutside) and "Dreams at the Au Bon Pain" ( Ibbetson Street) Harris Gardner, his co-founder, said that two artists from the group will be commissioned to design the plaque. "The Bagel Bards is an egalitarian literary group and has writers that rank from professors to paupers, to the published to the unpublished," according to Holder. Such well-known poets as Afaa Michael Weaver, Miriam Levine, Tino Villanueva, Kathleen Spivack, Clayton Eshleman, Dianna Der Hovanessian have attended the group, as well as respected local bards like: Barbara Bialick, Zvi Sesling, CD Collins, Timothy Gager, Irene Koronas,, Mary Buchinger Bodwell, Lo Galluccio, Gloria Mindock, and others. Novelist Paul Stone and Luke Salisbury are regular attendees, as well as playwrights, science writers, journalists and other disciplines. Steve Glines, and Molly Lynn Watt work to put out a yearly anthology of the Bards' work, and Glines founded the Wilderness House Literary review http://whlreview.com an online lit journal. It was also announced that the Bards have a special shelf at the Grolier Poetry Book Shop, the famed all-poetry bookstore in Harvard Square. Holder said: " This is very gratifying thing to happen. This is a great grassroots group, we all pull for each other, and I hope it goes on for years to come." * Bagel Bard Poet Barbara Bialick has a framed displayed poem there called: "Sitting Alone at the Au Bon Pain in Davis Square"
like they’re having a party.